THURSDAY, June 11 (HealthDay News) — The World Health Organization on Thursday declared the first flu pandemic since 1968, triggered by the rapid spread of the H1N1 virus across North America, Australia, South America, Europe and regions beyond. THURSDAY, June 11 (HealthDay News)—The World Health Organization on Thursday declared the first flu pandemic since 1968, triggered by the rapid spread of the H1N1 virus across North America, Australia, South America, Europe and regions beyond. WHO director Dr. Margaret Chan made the much-anticipated announcement immediately after an emergency teleconference with flu experts from a number of countries. "The world is moving into the early days of its first influenza pandemic in the 21st century," Chan said in Geneva, according to the Associated Press. "The [swine flu] virus is now unstoppable." The declaration pushes the WHO alert status on the outbreak from phase 5, where it had remained for weeks, to the highest level, phase 6, as the number of swine flu cases hit close to 30,000 in the United States, Europe, South America and Australia. The rapid spread of cases in Australia, where they rose by more than 1,000 on Monday, appeared to fit a key criteria for declaring a global pandemic—if at least two regions of the world are hit. On Thursday, WHO said 74 countries have now reported 28,774 cases of swine flu, including 144 deaths, the AP reported. U.S. health officials on Thursday were not surprised by the pandemic announcement. "It's based on the data," CDC director Dr. Thomas R. Frieden said during an afternoon press conference. But, he added, "this does not mean there is any difference in the severity of the flu. There has been no change in the virus." "Here in the United States, we have been responding as if it were a pandemic already," Dr. Anne Schuchat, director of the CDC's National Center for Immunization and Respiratory Disease, added. What the pandemic declaration means, she said, is that "for countries that were not seeing the flu we have seen here, they need to dust off their pandemic plans." In a separate statement in response to the WHO announcement, U.S. Department of Health and Human Services Secretary Kathleen Sebelius said, "What this declaration does do is remind the world that flu viruses like H1N1 need to be taken seriously. Although we have not seen large numbers of severe cases in this country so far, things could possibly be very different in the fall, especially if things change in the Southern Hemisphere, and we need to start preparing now in order to be ready for a possible H1N1 immunization campaign, starting in late September." And U.S. Department of Homeland Security Secretary Janet Napolitano added, "This decision comes as no surprise. We acted aggressively to stay ahead of the virus as it spread across the country. Now our challenge is to prepare for a possible return in the fall." "The Obama Administration has been working together across the government, and will continue to do so over the weeks and months ahead to keep the American people safe," she said. According to WHO statistics, the last pandemic—the Hong Kong flu of 1968—killed about 1 million people. By comparison, ordinary flu kills about 250,000 to 500,000 people each year. Other experts also cautioned that the new declaration does not mean that the swine flu has gotten more severe. "A World Health Organization level 6, which in effect states that H1N1 infections are now worldwide in distribution, is simply a declaration of the extent of geographic spread, and not a statement of severity of the clinical disease," Dr. Pascal James Imperato, a former New York City health commissioner and dean of public health at the State University of New York's Downstate Medical Center, said in a statement. "The disease remains relatively mild in most people. A positive consequence of this declaration is that it empowers countries to move forward with vaccine production." Chan on Thursday also characterized the H1N1 virus as "moderate," and WHO officials said they would be now urging flu vaccine makers to start producing swine flu vaccine. Since the outbreak started in April, health officials in the United States have also said that infections have been mild for the most part, and most people recover fairly quickly. Testing has found that the H1N1 virus remains susceptible to two common antiviral drugs, Tamiflu and Relenza. U.S. health officials have said there's no way to tell now if the H1N1 virus will be more virulent when -- and if -- it returns to the Northern Hemisphere with the approach of winter. 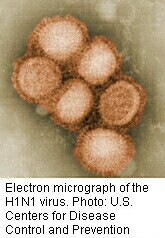 A vaccine for the swine flu virus could be ready by October, if research and testing proceed on pace this summer. Candidate viruses have been shipped to vaccine manufacturers, agency officials said. Time.com: How Fast Could a Swine Flu Vaccine Be Produced?